Tours are available every 10 minutes from either Mill Lane Punting Station or Quayside Punting Station on Magdalene Bridge, from 09:00 until dusk; closing times vary throughout the year – please check around your planned visiting time. 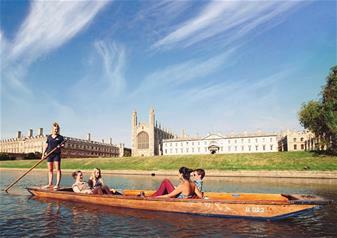 An essential part of any visit to Cambridge, a punt is the best and most traditional way to see the city. Led by an accredited expert guide, board the punt and take a seat in the special, flat bottomed boat, kitted out with cushions and blankets for extra comfort. Learn about the foundations of the University of Cambridge and how the city was built around it. Sail underneath the stunning Bridge of Sighs, built in 1831 and a favourite of Queen Victoria’s. See the Mathematical Bridge – the curved wooden structure that is made entirely out of straight pieces of timber. The city of Cambridge is stunningly beautiful and the River Cam travels along the backs of some of the most famous colleges in the world. Learn about the famous alumni, the history of the establishments, buildings and structures and relax as you travel along one of the UK’s most picturesque rivers. Tickets are used on a walk-up basis and are valid for 6 months after purchase date. Punts are shared and the tour lasts around 45 minutes. Tours leave every 10 minutes from either Mill Lane Punting Station or Quayside Punting Station on Magdalene Bridge. This activity is partially disabled friendly, please enquire when booking. Closing times vary throughout the year and we urge customers to check around you’re their planned visiting time. All of our closing times are listed week by week on our website. Quayside, Cambridge, CB5 8AB or Granta Place, Mill Lane, Cambridge, CB2 1RS.